Following the launch of its first outlet at Marina Square in March 2015, O’ma Spoon (pronounced as “oh my spoon”), a Korean dessert cafe, has since opened a second outlet at 313@Somerset, with an eye-catching pink neon at the front and a white tree fixture as its centrepiece. Its Korean owner, Chris Chun, hopes to transport the Korean bingsu boom to Singapore with this brand. 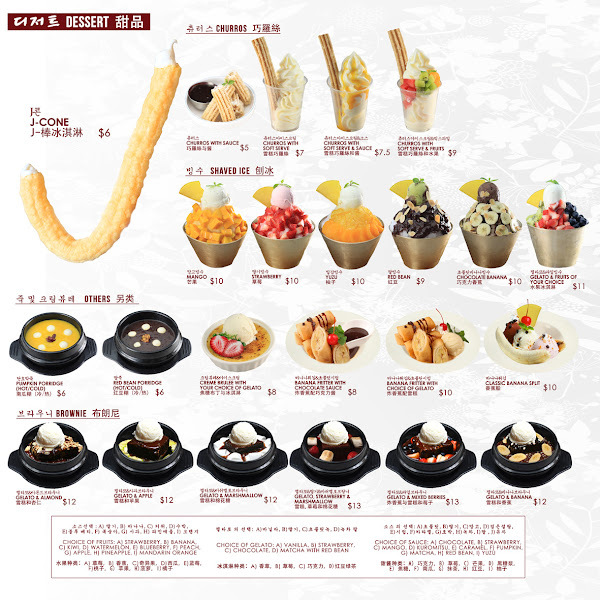 In recent months, I’ve noticed that more and more Korean bingsu cafes have opened in Singapore. Most of my friends have commented that these bingsus are more “atas” versions of our local ice kacang! ^_^ Regardless of the price, they seem to be rather popular with the younger crowd! The snow-like bingsus found at O’ma Spoon are created purely from premium milk. Fresh milk is poured directly into a specially-designed machine and flash frozen at -25°C to form tiny shards of milk ice with a fluffy texture, keeping the icy dessert light without compromising on the creamy flavour of the milk. Choices, choices, choices…what should we try?? My hubby and I had 3 bingsus in one night and received incredulous stares from the people seated at the surrounding tables! 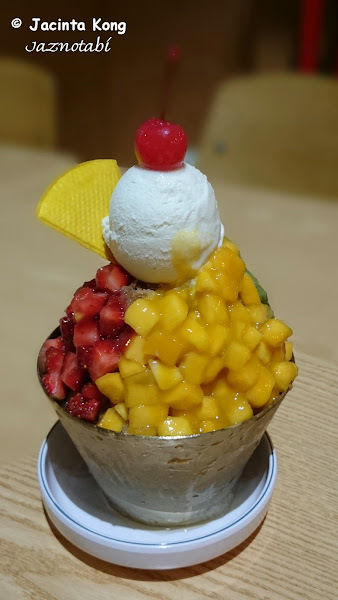 Assembling a bingsu involves the stacking of various ingredients and this has to be done in an organised way to ensure that they won’t topple! You first start with a base of milk ice, which is then topped with a variety of ingredients like fruit, nuts, cakes and ice cream. The initial taste of this dessert cafe’s bingsu feels quite light on the tongue with only a hint of dairy contained within. As the ice starts to melt, a richer flavour of the milk comes through. 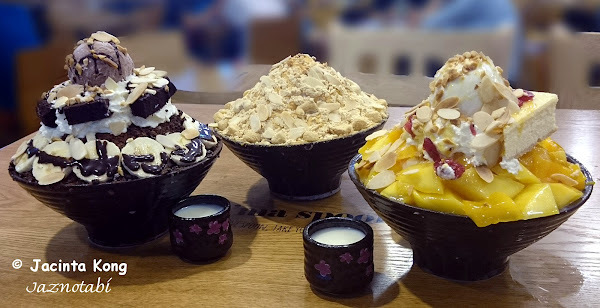 For those who have a sweeter tooth, a small cup of sweetened milk is served with each bingsu, so you can add to your heart’s content. Choco Brownie Bingsu – The milk ice base of the bingsu is first sprinkled with Oreo cookie crumble then lined with sliced bananas, before it is topped with whipped cream, brownie squares and a scoop of chocolate ice cream. As a final touch, chocolate sauce is drizzled on the bingsu alongside toasted almond flakes. 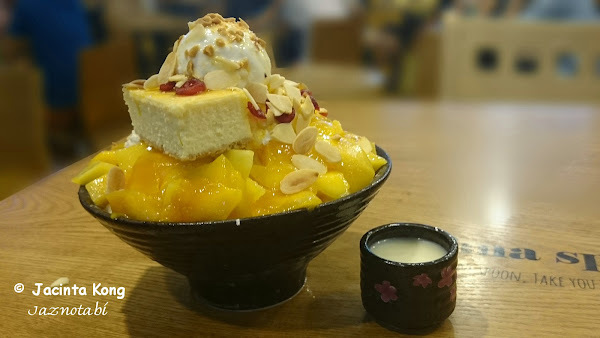 Mango Cheesecake Bingsu – Cubes of sweet ripe Thai mangoes sit atop the milk ice bingsu and this is topped with blueberries, a slice of New York style cheesecake, a scoop of vanilla ice cream and finally a sprinkling of toasted almond flakes. 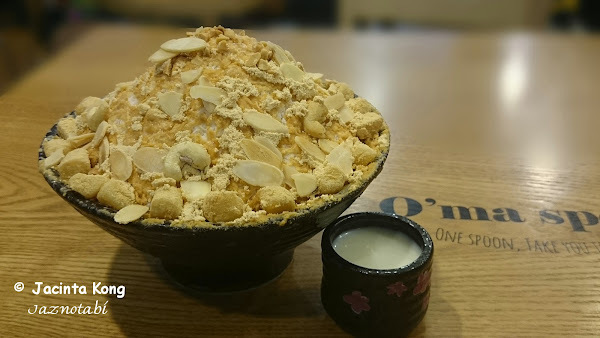 Injeolmi Bingsu – This bingsu is dusted with toasted soya bean powder and dressed with cubes of chewy injeolmi rice cakes, cashews and toasted almond flakes. These bingsus are generally designed for sharing with friends or family (but I’ve seen people having one all to themselves). 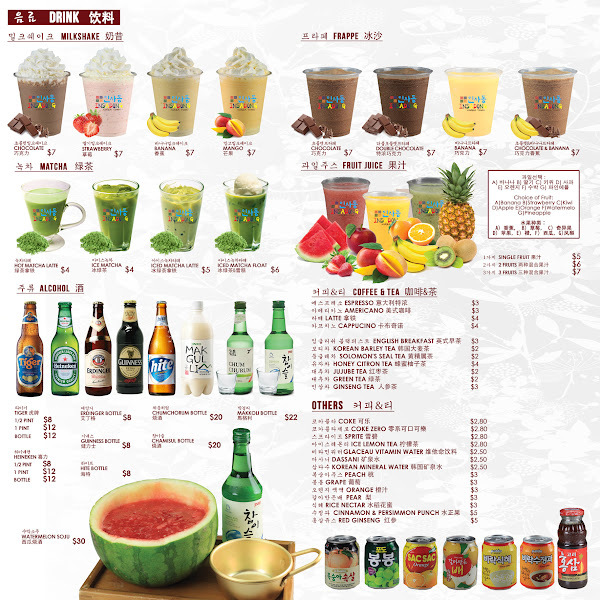 There’s even an OMG Bingsu on the menu but we haven’t tried it yet!! If you find the serving too huge and want something smaller, Petit Bingsus are available and these are served in cups. Available flavours are: Pat (red bean), Injeolmi, Mango and Oreo. Is that anything else available apart from bingsu? Well, the cafe offers a selection of Oven-Baked Honey Bread, as well as Oven-Baked Toast. Their Signature Oven-Baked Honey Bread is directly imported from Korea and this two-inch thick bread is covered with butter and Korean honey, which is a natural sweetener. 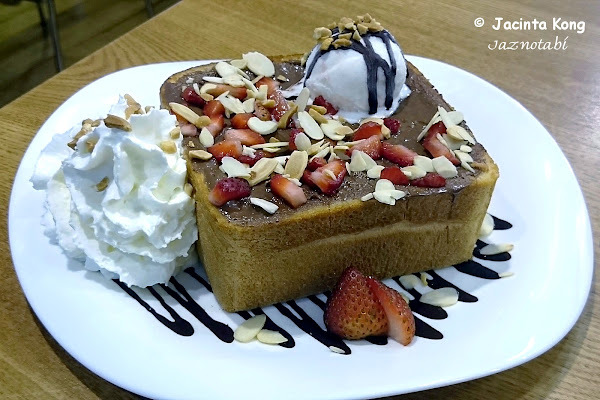 Choco Strawberry Honey Butter Bread – This has a Nutella spread which is then topped with strawberries and vanilla ice cream, and served with whipped cream, chocolate sauce and a generous sprinkling of almond flakes. Injeolmi Toast – From the Oven-Baked Toast selection, this dessert features chewy injeolmi rice cakes which are sandwiched between two slices of bread before they are lightly toasted. Look at that gooey texture from the rice cakes! This was a hosted food tasting event, thanks to O’ma Spoon! Payment Modes: Cash, NETS and all major credit cards accepted. **UPDATE** This place closed for further renovations a few weeks after it opened and recently re-opened in December. 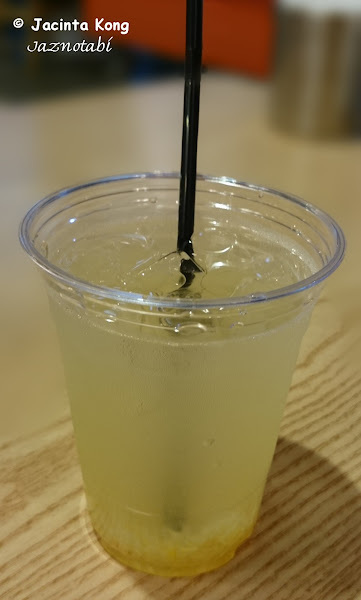 The new method of ordering is via self-service kiosks and the place where drinks were previously purchased from has been converted to a drinks and desserts corner. 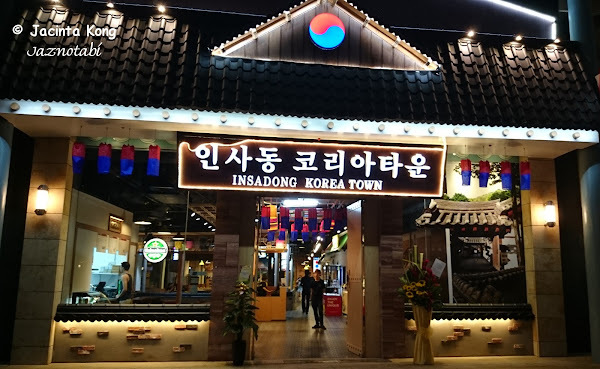 Its main entrance is decorated to look like those traditional Korean buildings and I took some pictures of how it looks during both day and night. 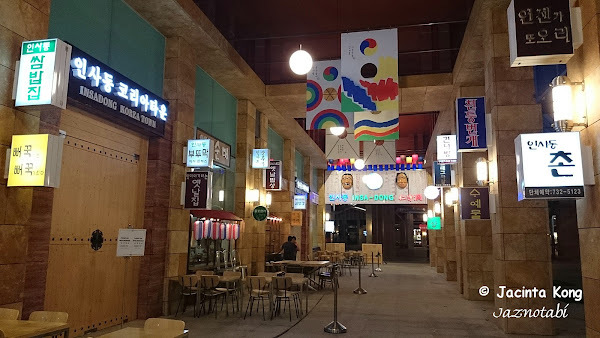 This place can seat over 300 diners and is decorated to resemble the famous Insadong street in Seoul, Korea. There are some decorations and a door along its side wall but you are not allowed to enter from there and have to return to the front to get in. On the immediate left upon entering, is the counter where drinks can be purchased from. Food orders are placed at this other counter located directly ahead and payment is made upon ordering. The menu is displayed on the wooden partition next to the cashier counter. Once you have made your payment, you will be given a ticket with a queue number (one for each food item), so go find a seat and wait for your number to be flashed on the TV screen, then collect your food from the “Food Distribution” counter. The decor at the far end looks quite interesting. If you are dining with a bunch of friends, you can consider sitting at this roadside cart. Cutlery can be obtained here. When your ticket number is displayed, collect your food from this “Food distribution counter”. There are side glass panels next to it where you can actually peek into the kitchen to watch the chefs at work. 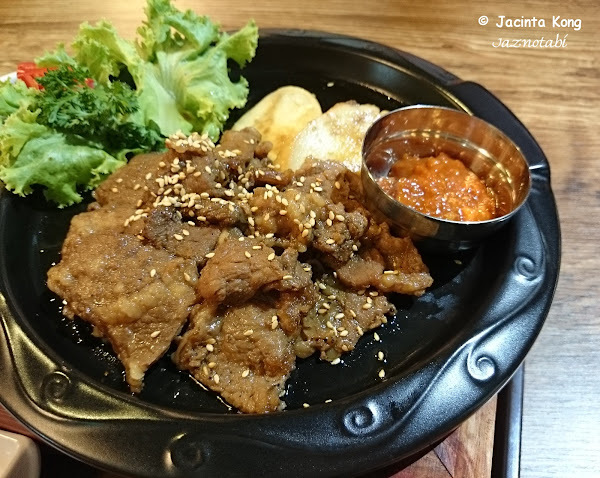 GALBI GUI (Grilled Prime Beef Ribs) – The boneless beef slices were well marinated and very tender. This set is served with a bowl of rice and 3 side dishes (anchovies, pickled radish and kimchi). 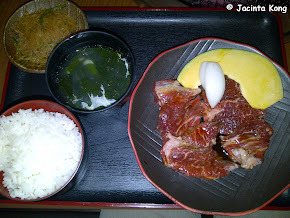 The little dish next to the beef contains some kind of bean paste which you can use as a dip for the beef. MSG-intolerant folks may want to skip this bean paste (I was thirsty the whole afternoon after the meal!). Taste-wise it was good but the food got cold when I was halfway through the meal. It would have been perfect if the food was kept warm until I was done with my meal! Hopefully they will take this into consideration! 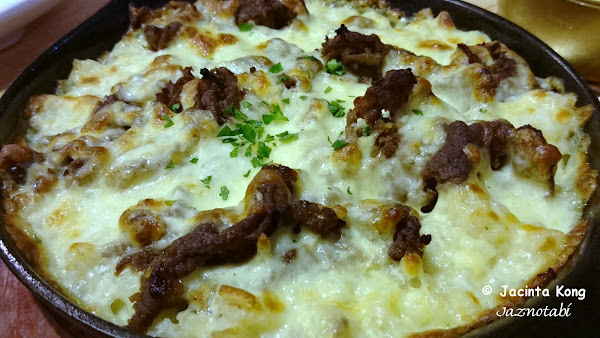 Here’s a closer look at the delicious morsels of beef! 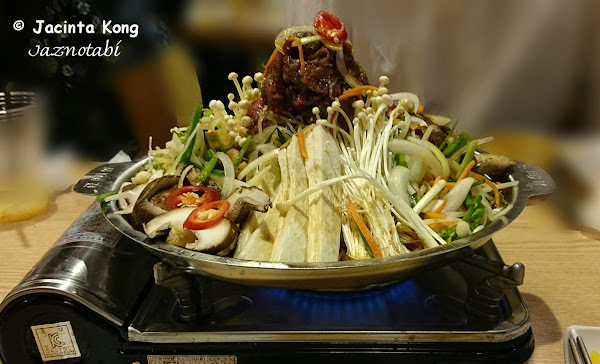 LA GALBI GUI (Korean Style Grilled Beef Ribs) – Each slice of beef was attached to a bone but the meat was chewier than the Galbi Gui (see previous dish) and thus was a bit difficult to separate from the bone! Raw vegetables were given in a side cup and you can dip them into the accompanying bean paste and eat them with the beef. I think I prefer the Galbi Gui over this although it costs a bit more (+$4) but the meat tastes better and isn’t as chewy. 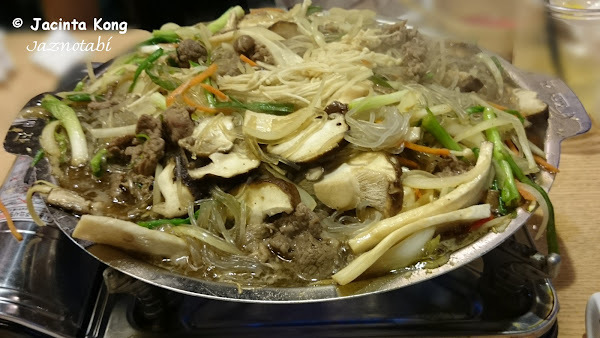 JJAJANGMYEON (Korean Black Soybean Sauce Noodle) – This is my hubby’s favourite Korean dish and thus he ordered the one here to try. 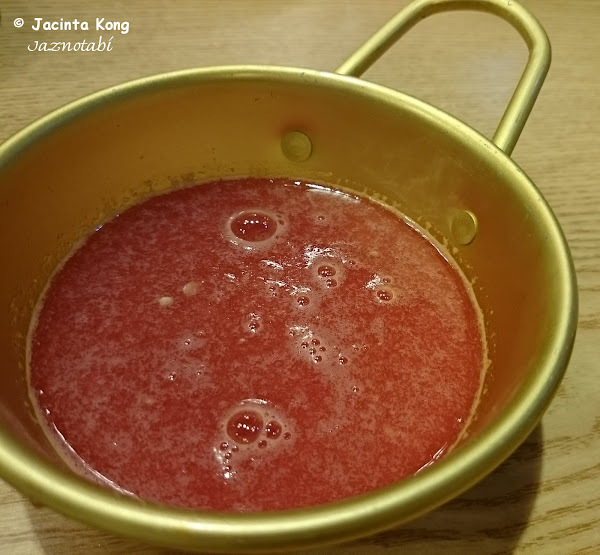 The sauce was flavourful with a wok hei taste and he enjoyed the noodles very much except for the fact that it was a meatless dish. I tasted the sauce and it was good! 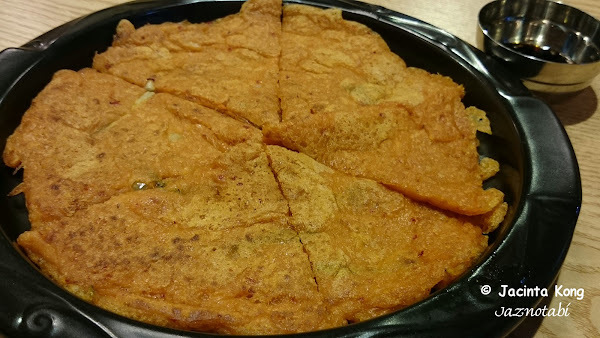 BUCHU JEON (Chive Pancake) – It was a combination of chewy flour dough and chives and somehow tasted better after you’ve dipped it into the sauce. I didn’t really like the texture of the pancake and I’m not a fan of chives, so my hubby ate it all! 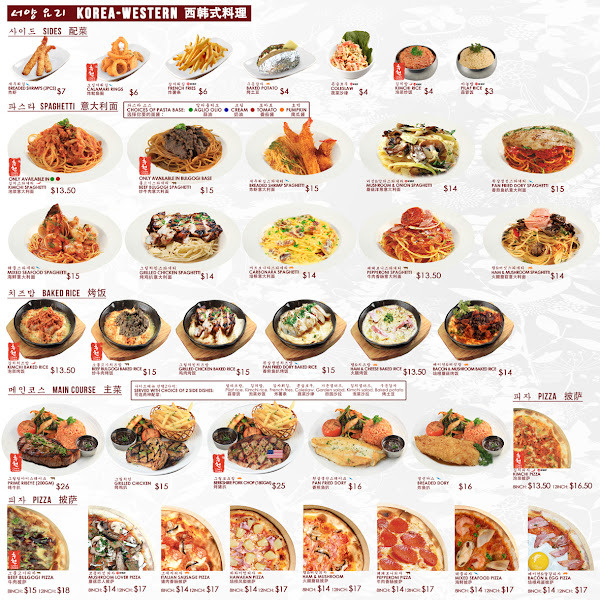 LOL… Anyway, this was a complimentary dish for RWS Invites members if you spend over $20 in a single receipt (promotion period from 1 – 30 September 2014). When you are done eating, return your food tray to either the “Return tray counter” or the tray racks which can be found at several spots within this eatery. Verdict: Out of the dishes which we had tried, I only liked the Galbi Gui and my hubby said he would come again for the JjaJangMyeon. On my way out, I spotted something interesting but I wasn’t sure what it was – A snack?? A dessert?? Curiosity got the better of me so I went to enquire about it. The cane is actually a corn snack and is a hollow shell, so vanilla ice-cream will be pumped into it when you purchase it. Apparently it is known as ‘Jipangyi‘, a traditional crispy corn snack in Korea. This is Korea’s No. 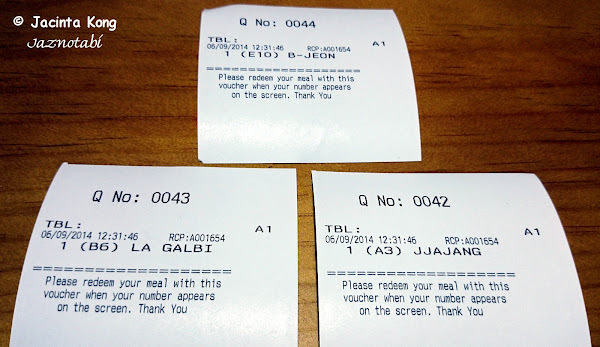 1 Chicken Restaurant but its name certainly doesn’t sound Korean! BBQ stands for Best in Quality. 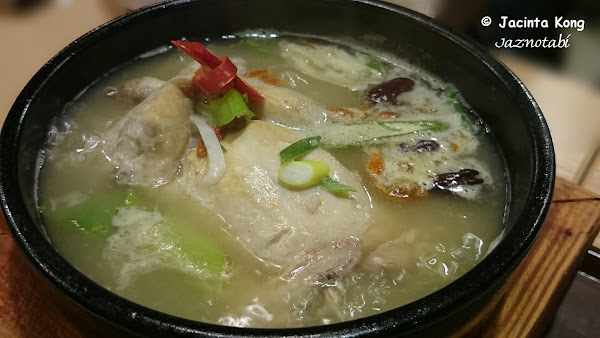 I dined at the outlet located at Rivervale Mall. 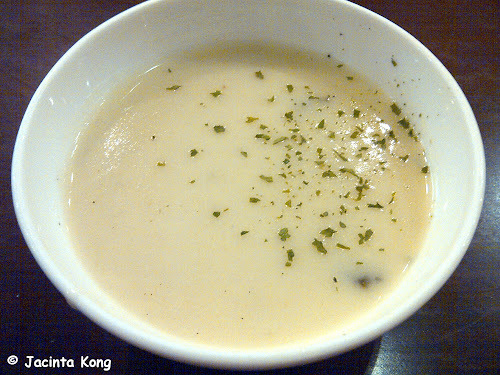 Soup of Day – The soup tasted like Cream of Chicken, which also contained some tiny pieces of fresh shiitake mushrooms. 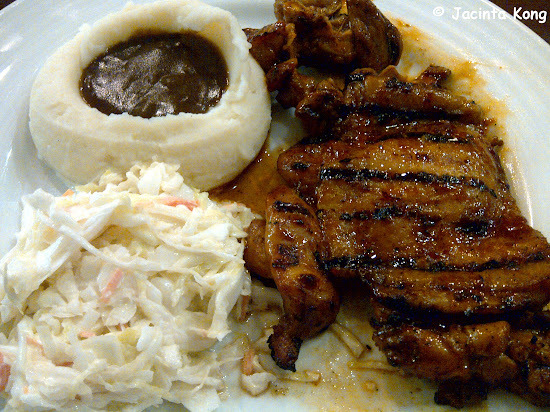 In my attempt to eat healthier, tried the grilled chicken instead of the deep-fried items on the menu. I chose mashed potato and coleslaw. I liked the grilled chicken which was well marinated and was a little spicy. However, both the mashed potato and gravy were cold and that made it a little unappetizing. I would consider going back again for the grilled chicken but not the side dishes. They have several branches scattered in various parts of the island so do check their website for more details. 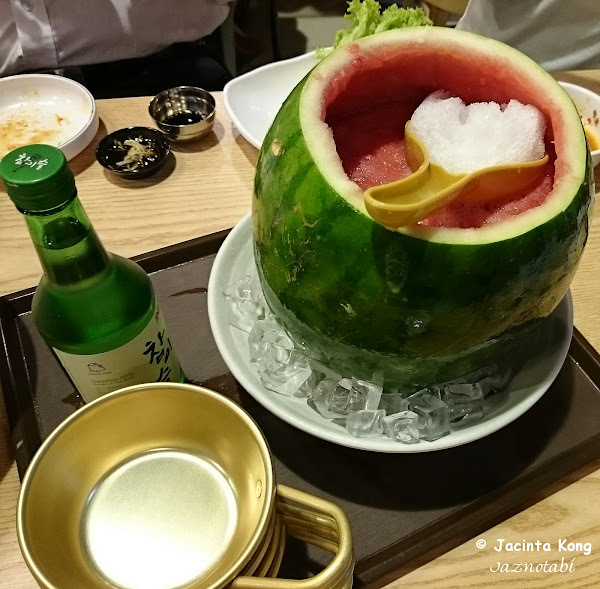 This is one of the latest restaurants which opened at The Central and seems to specialise in yakiniku so I decided to check it out. 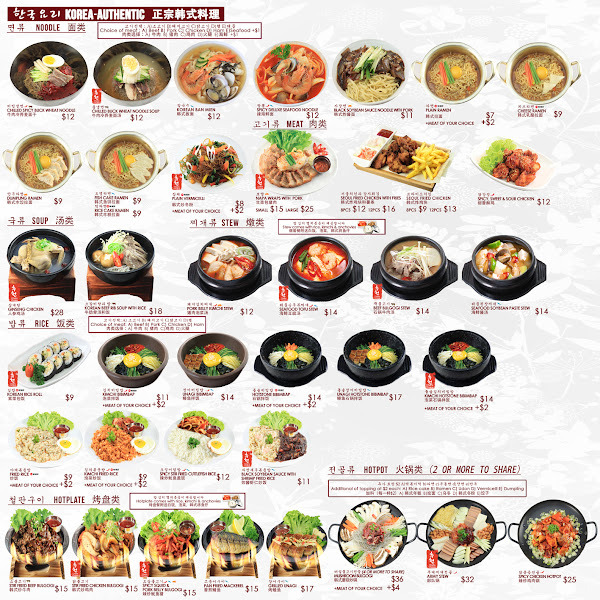 All their set meals come with a serving of kimchi and they also serve a selection of different types of bibimbab. Thus, it made me wonder if this was a Korean restaurant instead of a Japanese restaurant!! Ordered a Karubi Lunch set ($13.99++) and this consisted of 7 slices of beef, a bowl of seaweed soup, a side dish of spicy tang hoon (vermicelli) and some cold tofu, veggies and kimchi. Very Korean indeed! Taste-wise…I found it to be Korean instead of Japanese! 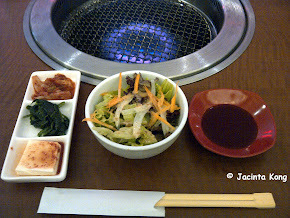 Everyone agreed the food both looked and tasted Korean. 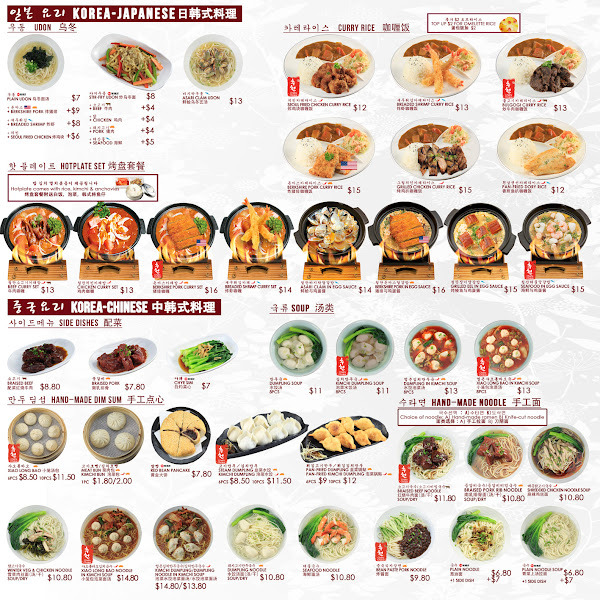 Hmm… so why does the restaurant have a Japanese name then? ?